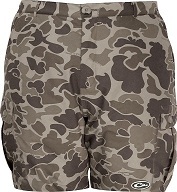 Drake's Dura-Lite Camo Shorts are lightweight, comfortable, and built for every outdoor pursuit. Whether you are working around the duck camp in the summer, dove hunting, or camping, these camouflage shorts will keep you cool and dry. The Dura-Lite Shorts are constructed of breathable polyester material that dries quickly and resists fading.